Returning from Biscayne Bay, Florida a few days ago we were reminded that in this age of electronic navigation, command, control, and monitoring, you still need to maintain a traditional situational awareness. 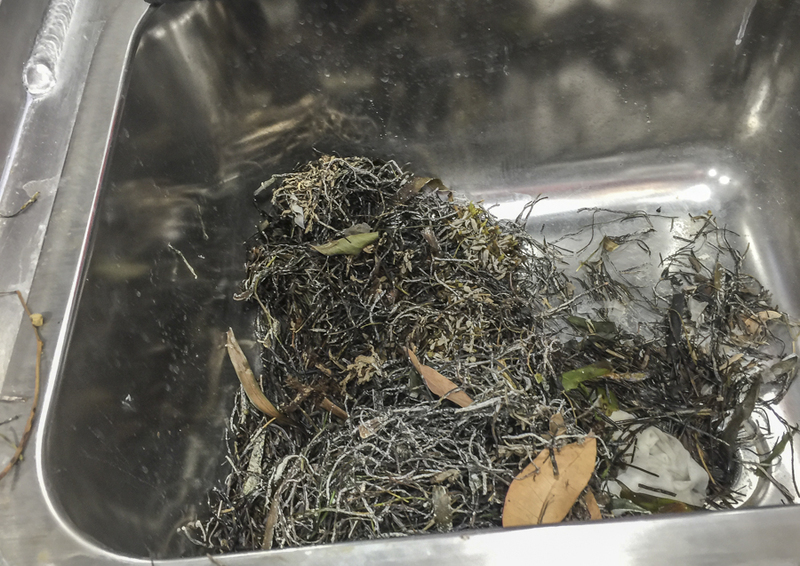 The sink full of marine weeds is a classic example of why this approach is still beneficial. We like to check the engine room once an hour. Hearing, sight, and smell tell us things that our extensive Maretron N2K monitoring system cannot. In this case, walking down toward the main deck there was a different tone to the exhaust. A quick look over the side showed that the water flow on the starboard side was much reduced. 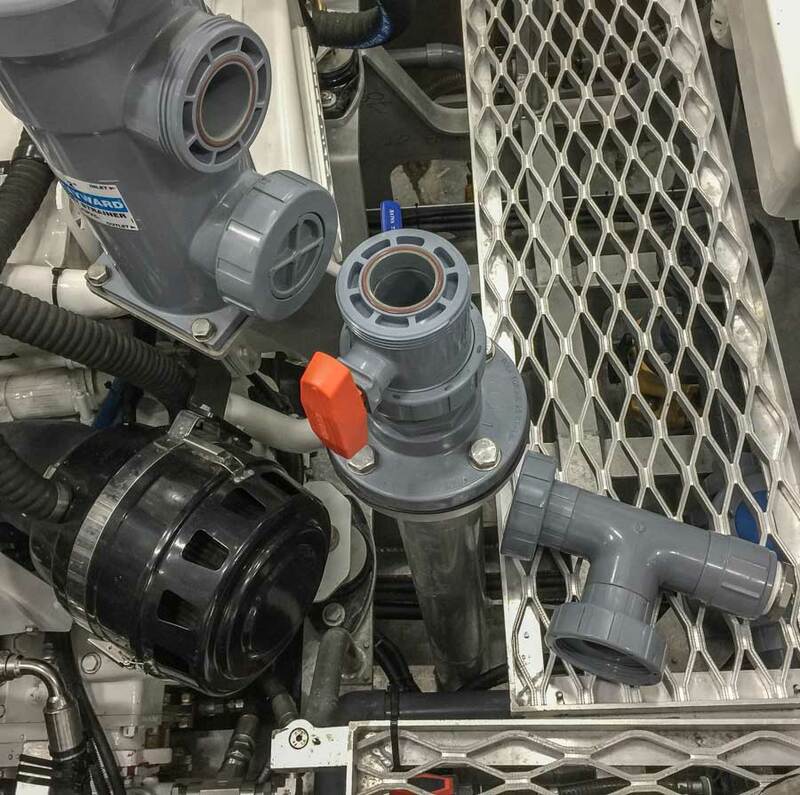 We have temperature probes on the raw water pumps, exhaust injection elbows, Aqualifts, and shaft seals. These would have eventually told us there was a water flow issue, but not before an impeller was damaged from lack of water flow. Each engine, the genset, and the engine room raw water consumers have a large CPVC filter, and these were all heavily packed with weeds, as were the pipes from valve to strainer. The strainer is easily removed and emptied, then cleaned in the nearby sink. But the pipes were a different matter. A little forethought makes these easy to take apart and clean. The elbows have an O-ring sealed flange face tightened with a large nut. A few seconds and the elbow assembly was removed and easily cleaned. Note that the lower flange of the valves are above the waterline, so the valve can be removed for maintenance without hauling or plugging. This entry was posted on Saturday, March 18th, 2017 at 7:47 am and is filed under Dashew Logs, FPB 78, The Logs. Both comments and pings are currently closed. Are there clear versions of this tubing? That would be helpful. The CPVC tubing we use we have only seen in grey. However, clear allows in light, and the light promotes biologic growth. Surely the lights in the engine room are not on constantly, and this water is not stationery in the pipes, it comes in, cools the engine and is sent over the side within a very short time. Is growth really likely? Our experience is that if you have a clear inspection plate on the top of the inlet pipe and do not cover it that over time vsibility will become obscured and the growth that occurs even in the dark will be enhanced. Would be nice to have direct inspection. We have not found a system that passes muster with the surveyors and that remains clear over time. Also, the pipe clogging issue has been rare in our experience. Three times in the last 50 years or so. I fitted a vacuum switch drilled and tapped into the strainer, this then sets off a light and buzzer at the helm, about £12 of parts and 3 hours work, it can be set as sensitively as you require, as I boat out of a weedy bay it gets a fair amount of use, easily tested by just restricting the water flow with the valve. Great idea. Details on the vacuume switch? 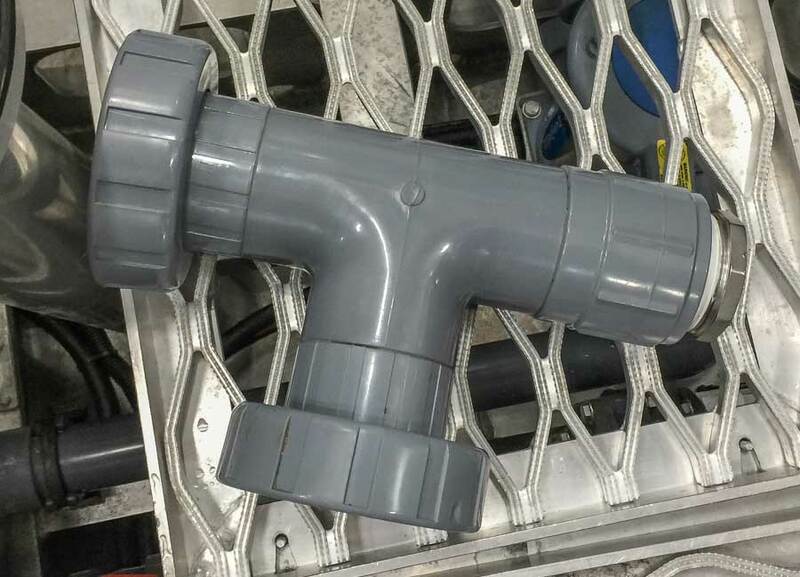 RS component with a 6mm spigot on it add a 6mm tube looped in a spiral and filled with castor oil attached to a 6mm hosetail fitting self tapped into strainer body, adjustable with a little screw in the switch to be as sensitive as required. Lancing marine uk sell them already to go I believe. send me an email if you want photos etc, sorry but have not got part numbers. A couple of photos and parts numbers would be great when you have time. Why not using a keel cooler and eliminate all clogging issue of any kind, marine weed or slushy snow when sailing high latitude. 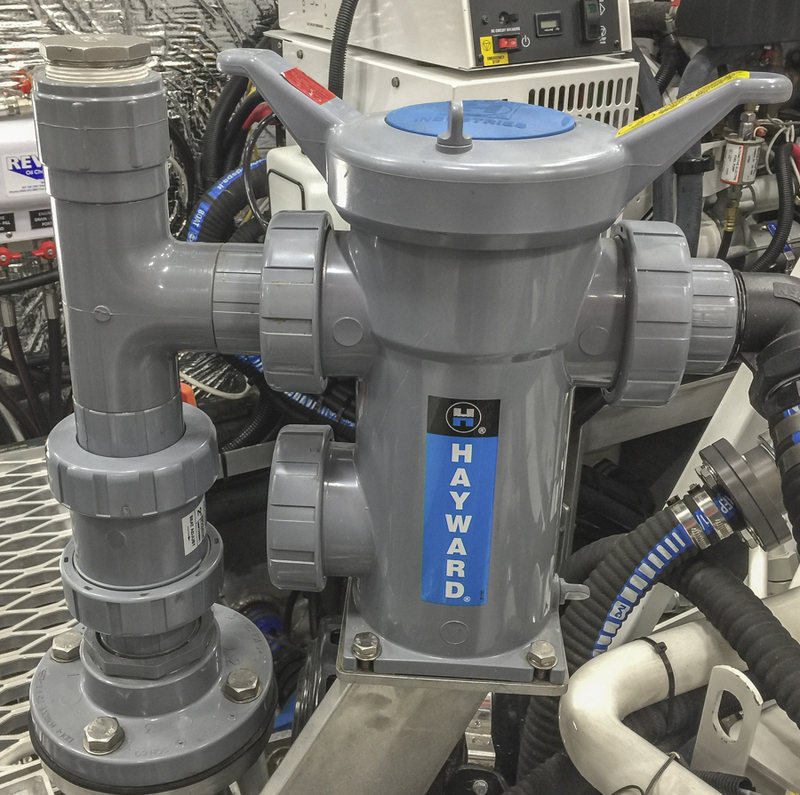 We do use hull cooling for hydraulic oil, and often for fridge and HVAC applications. But keel cooling for exhausts means either a water pump for the exhaust or a dry stack. Dry stacks have their own issues. Given the rarity of clogged engine filters and the ease of cleaning, we think this is the best answer.